Gerber eFECT Maintenance Tool » Protective Solutions, Inc. The eFECT Military Weapons Maintenance Tool was developed for the distinct purpose of cleaning and maintaining an AR15/M16/M4 variant. Whether you're at the range or on patrol, the eFECT incorporates components that make field cleaning faster and more precise. 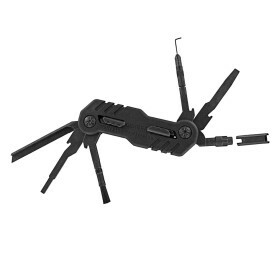 It is compatible and interchangeable with Otis cleaning components such as brushes, scrapers, picks and rods.